L-R: The Rev. Ngira Simmonds, Peter Bargh N/TSSF, and the Rev. 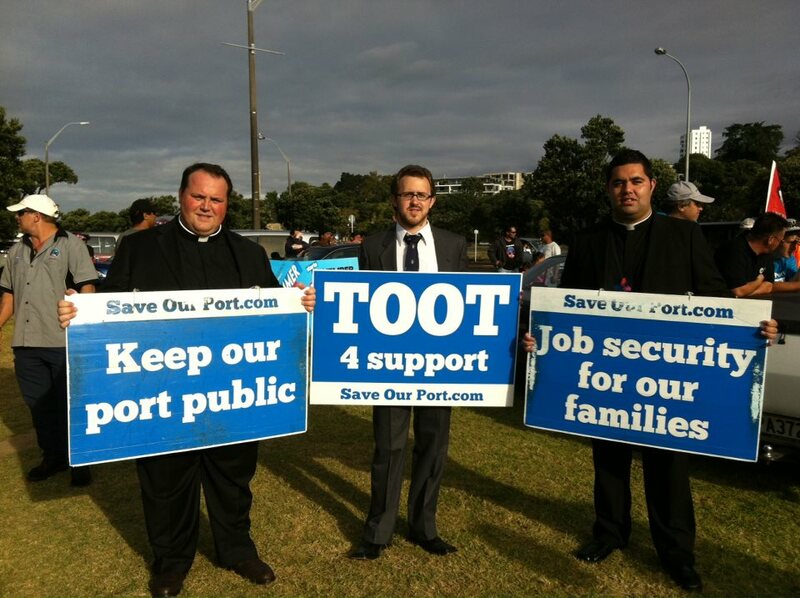 Christopher Huriwai at the Ports of Auckland Rally. May the words of my mouth, and the meditation of all our hearts remain acceptable in thy sight, O LORD our rock and our redeemer. Well whanau, here we are, right in the thick of it. It’s the third Sunday of Lent and while our thoughts maybe turning to the hope and promise of Easter, and not to mention the Easter holidays, we need to continue to think about exactly what it is we are being called to reflect on this Lenten season. Here and now, as we pass through the half way point of Lent for this year, it is perhaps all the more important that we keep our calling at the forefront of our minds as we crossover into the second half of this season of Lent. As Christians, we each have a fundamental, baseline calling, that is a calling to love and to serve, and here and now, during Lent is the perfect time for us all to reflect on what it means to be called to love and to serve, not just those we know and love, but those we don’t know, and perhaps even more importantly, those we find it hard to love. In our reading today, Jesus is actively clearing out the clutter; in our bibles this section of the Gospel of John is named “Jesus Cleanses the Temple.” Although in our reading, this clearing out is a literal one, I think that what we can take from this reading is not a literal calling to clear out everything from our Whare Karakia (Churches), but rather a calling, and an invitation to clear out, and cleanse ourselves from those things that clutter and gather up within us, that hinder, and in some instances even stop us from living out our calling to love and to serve. On the first Sunday of Lent I preached about the importance of allowing our faith to inform our actions, and in doing so, allowing our faith to become more than just an abstract idea. Here and now as we reflect on the importance of clearing out all those things that clutter our lives, we are given an opportunity once again to let our faith become a real and informing part of our lives so that when we are called upon to respond to issues that strike at the very core of our lives, we are ready and equipped to do just that. Since last year, but in the last few months in particular, we have been witnessing the unravelling of one of those issues that strike at the very core of our faith and demands us to respond in a prophetic and loving way. I am of course talking about the issues surrounding the Ports of Auckland. The issues surrounding what is happening down at the Ports aren’t just a matter of money, although that’s what the big wigs down there would have you believe. The real issue is one of security and certainty, and the Port of Auckland’s attempt to deny those basic rights to their workers. Much like the earthquake in Christchurch, which brought words like “liquefaction” into the everyday vocabulary of all New Zealanders, the Ports of Auckland issue has also taught us a new word, “casualisation.” The new contracts that the workers were being asked to sign turned them all into casual workers, effectively casualising the entire workforce of the Ports of Auckland. Now, it may seem as if this isn’t too bad a deal. They will still be employed, they will still be working, and they will still be getting paid. But whanau, the issue is the uncertainty and complete lack of security that comes with being a “professional” casual worker. Not knowing when you are working, not knowing how many hours you will have each week, not even knowing what your weekly income will be. All of these things increase the levels of pressure and tension on the workers of the ports, not just on the job with their work mates, but at home with their families as well. Whanau, it is issues such as these that demand us to live out our calling to love and to serve and to meet these issues head on with the conviction of our faith and the knowledge of our calling. Like I said in the first week of Lent, we are called to respond with action, informed by our faith, no matter how small that action may be. Yesterday, a couple of my friends and I decided that we would try and do something like that. We decided that our faith was calling us to establish a physical presence with the demonstrating workers and other unions as they marched and rallied from Auckland City to the Port. Although our actions were small, after all, all we did was walk, it was real, it was intimate and it was deliberate. It was action inspired by our calling, informed by our faith and lived out in the real world. What we have here in our reading is a bit of a blue print, an example of sorts for us as followers of Christ to ourselves follow. One problem with our reading this morning is that it has become so familiar to us that the real intensity and craziness of it has all but worn off, but let’s think about it for a while. Here we have Jesus, the Prince of Peace, effectively storming the temple. Not only that, he actually made himself a weapon of sorts and physically drove out those in the temple who he saw as degrading the house of God. He turned up tables, he drove out the animals he rebuked those present. Here we have the same Jesus who calls us to be as gentle as doves, being the complete opposite! He is angry, he is passionate, and he is doing something about it. Now this doesn’t mean that we should be leading the workers at the Ports of Auckland on a rampage through the head offices of the Ports, or that we should all go to the City Council chambers and tip their tables over, rather it means that we should be open to allowing our emotions, our feelings and our passion become a part of our calling. We need to remember that just like Jesus, we act not just on behalf of ourselves, but by virtue of our baptism and our callings we act on the behalf of God. That might sound a bit odd, or even a bit whakahihi (proud), but what it really means for us as Christians, is that we need to be constantly looking for the money changers in our society and not be scared to act on our calling and effect change. It means that we need to be on the lookout for those issues that threaten to oppress and marginalise people and speak out, and indeed act out prophetically and with passion. Whanau, if we take the opportunity we are given during this time of Lent, to clear out and cleanse ourselves of all of the clutter that builds up within our own lives that can hinder us from living out our calling, we will be all the more ready to respond with emotion and passion when we are faced with a decision to either keep silent or speak out. And so I leave you with those thoughts in the name of the Father, and the Son and Holy Spirit. AMEN.